"About Face" interview for The Laura Flanders Show up at Free Speech TV! Here’s a recent interview I did with The Laura Flanders Show on Free Speech TV about my comics essay “About Face”, which connects the rising normalization of fascist & paramilitary presence with a generation’s worth of civilian consumer style choices. Thanks so much to Vanessa and Trevor over at Popula for giving this comic a good home! "About Face"-- new comics essay at Popula! 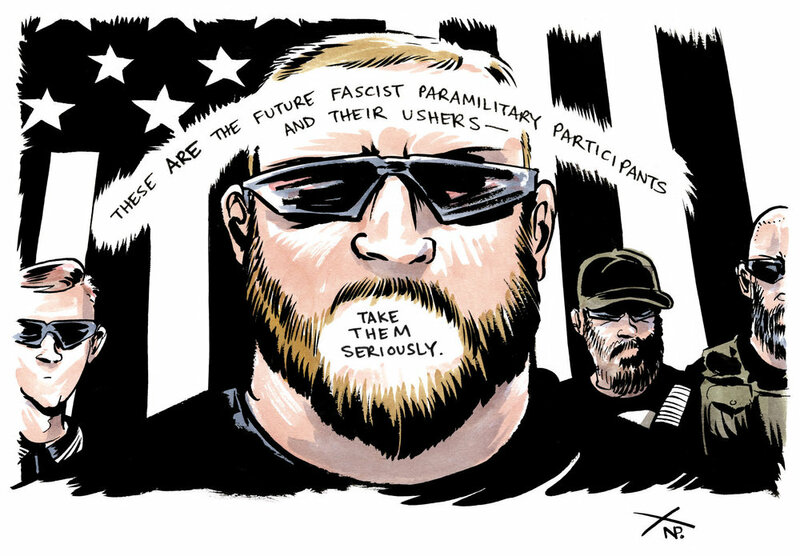 I have a new comics essay up at Popula: “About Face”, which breaks down paramilitary influence on military regulation, and how those stylistic changes, crystallized as consumer style preferences, are strong indicators of successful normalization of modern fascist aesthetic and presence in the US. Punisher skulls. Black and white flags. Beards, hats, and wraparound Oakleys. Totally blacked-out Dodge pickup trucks. This essay also functions as a post-script to my 2011 book Any Empire. Popula is a great new indie publication, and I encourage you to subscribe and support it here. Thanks! Here's another new interview up at Full Stop, about the creative process, March, growing up in the South, comics, politics, and punk. ANY EMPIRE in Best American Comics 2012 Notables List! I'm pleased to discover that my graphic novel Any Empire was included in The Best American Comics 2012 Notables List! Congratulations to comics friends Anders Nilsen, Sarah Glidden, Jesse Jacobs, Jordan Crane, Kate Beaton, Vera Brosgol, Box Brown, Brian Chippendale, Lisa Hanawalt, Kevin Huizenga, my amazing teacher Ben Katchor, Tom Neely, GB Tran, Jeff Smith, Noah Van Sciver, and Becky Cloonan for their inclusions into the Best American list this year! BLOOMINGTON-- in-store signing/ book release at Vintage Phoenix Comics! If you live in Bloomington IN, I'll be doing a signing/ book release throwdown at Vintage Phoenix Comics (114 E. 6th St.) on Friday, June 15th from 7-9pm! This will be in conjunction with the year's release of Sweet Tooth #34, The Year Of The Beasts, and The Silence Of Our Friends. Original artwork will also be for sale. See you there!